I first tasted fresh cherries only in the US, the dark ones, they tasted so good and from then on, I always bought bags of them during the season. In India, it's difficult to find fresh cherries, and even when you get them, you'll find the red ones which are not that sweet. But nowadays, you can find them in bigger cities, at least I found them in Bangalore. So then, when I got this big box of cherries, apart from eating them as such, I wanted to try out some dishes with it and the first one that came to my mind was this Cherry Clafoutis. 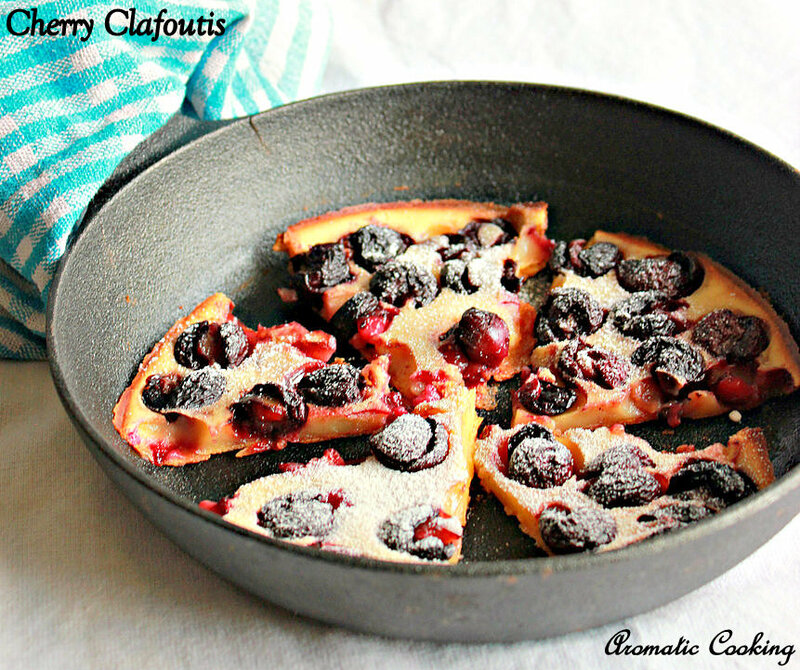 I have not tasted Clafoutis, but when browsing randomly, I saw it and for some reason it stuck to my mind. I made it with eggs first to know the taste, then I used custard powder as a replacement for eggs and it turned out good. Since I am not a big fan of eggs in baking especially in puddings and in these kind of dishes, I liked the eggless version better. If you can't find cherries, try it with other berries like strawberries and enjoy..
Add the flour, custard powder, salt, sugar, vanilla extract and milk and blend everything and keep. We have to pre-heat the oven to 175 C.
Grease a oven-safe pie dish, I have used a cast iron pan, so I heated it on stove top, melted some butter and spread it all over. Now pour a thin layer of batter, place the dish or cast iron pan in the oven for about 4 to 5 minutes, till the layer is set. We should place it in the oven just when it's still getting pre-heated ( half-way through ). 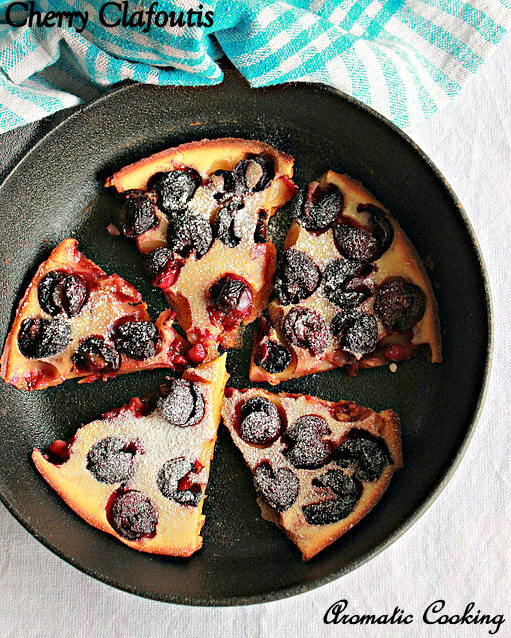 Now remove the dish, place the cherries all over, then pour the remaining batter and put it back in the pre-heated oven and bake for 40 to 50 minutes, till the top is completely set and the sides start to turn golden brown. Let it cool a little, slice it, dust the top with the sugar and serve it warm. 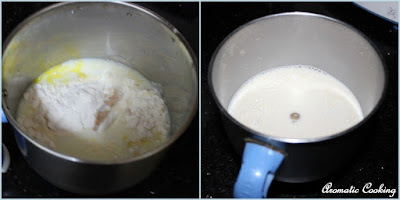 If you are using eggs, then use 1 for the above recipe. Depending upon the sweetness of the cherries, you can add more or less sugar. 8 teaspoons of sugar was just right for us. Depending upon the dish that we are using for baking, the baking time might vary, just check whether the top is cooked and set and the sides turn golden.